HCM City (VNA) – The police of Vietnam and the Philippines have worked together on the trans-national case trafficking 300 kilos of drugs in Vietnam and seized 276 kilos more in the Philippines. 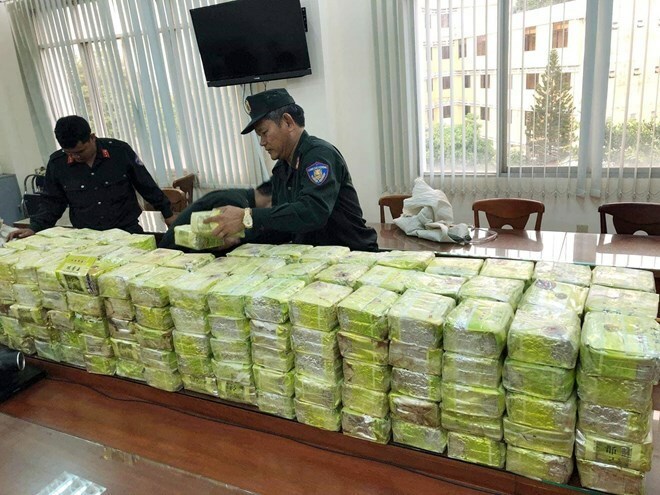 According to the Police Department for Investigation of Drug-Related Crime, the police of the two countries have expanded their investigations after 300 kilos of drugs were seized in Ho Chi Minh City on March 20. Along with the drugs, the police arrested 11 people, including eight Chinese and three Vietnamese on March 20. Initial investigation results show that the drugs were stored at Hassan trade and service Ltd in Binh Tan district of Ho Chi Minh City for transporting to Taiwan (China). The company’s director, Phan Thi My N., is a girlfriend of Ha S., a Chinese national born in 1963, who is suspected to lead a large trans-national drug trafficking ring. The police then discovered that Hassan is the camouflage of the ring. According to the police, drugs are often transported from Myanmar through Laos to Vietnam before being sent to a third country. Currently, the police are finalizing records to start legal proceedings against four suspects – Thao A Do, born in 1982 and residing in Dien Bien; Thao No Pao, born in 1974 and residing in Dak Nong; Ly A Vu, born in 1987 and residing in Dak Nong; and a Chinese called Huang Zai Wen, born in 1969.